Converse is an American shoe company with a production output that primarily consists of sports wear, and lifestyle brand footwear. Converse manufactures its products under the One Star, Chuck Taylor All Star, and Jack Purcell names. 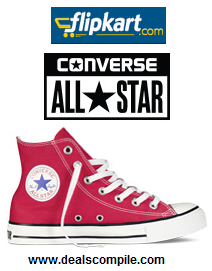 OFFER:Flipkart is offering 50% discount on converse shoes in its Deals of the Day section.